One of the reasons I love trail running is the lack of competition. Unless your name is Ben Nephew and you’re planning on winning the race, placement means very little. (And even Ben Nephew doesn’t win every race; though the local legend claimed Manitou’s Revenge and the Cat’s Tail this year, he came up a close second on the Escarpment.) Plus, unlike road races that feel they have to give you something for your expensive race fee, you’re not going to get a medal for your endeavors; in fact, you need to run the Escarpment six times and clock 100 miles just to get a commemorative shirt! As such, your only real competition is your own self and your own goal. Maybe you’re a first-timer and you’re just hoping to complete (as per myself on Manitou’s Revenge this year.) Maybe you’ve run a race several times before and you decide this is your year for a PR (as per myself on the Escarpment). And maybe you’ve ticked both those boxes once autumn hits and it’s time to leave the watch at home and just run to your heart’s content (as per the Cat’s Tail). Any which way, the people around you, in front of you and behind you are your compadres, not your competitors. They are the ones who will afford you respect and encouragement and reinforcement; they’re the ones who will offer you a high-five or a hug or a handshake when you finish – even if you best them right at the line. And on that note, it’s worth bearing in mind that at the end of the day, however well you do, the sun will still set. It will still rise the next morning. Your – or my – involvement in a trail race in one corner of planet earth will not affect the workings of the universe. 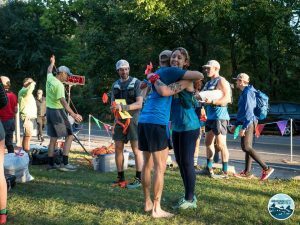 This can be a tough one to face up to when you – or I – achieve a long-term goal and only your – or my – closest running friends know enough of what it means to offer genuine congratulations. But that’s the duality of trail running: it keeps you – and me – humble, and yet it’s full of camaraderie. And that’s why you can’t beat it. A finisher receiving congratulatory hugs at the Cat’s Tail Trail Marathon, Oct 14 2017. To quote Meat Beat Manifesto, this is what it’s all about. Photo by Mountain Peak Fitness.